Turkish coffee is coffee prepared by boiling finely powdered roast coffee beans in a pot (cezve), possibly with sugar, and serving it into a cup, where the dregs settle. The name describes the method of preparation, not the raw material; there is no special Turkish variety of the coffee bean. Left: A cup of Turkish coffee. It is common throughout the Middle East, North Africa, Caucasus, and the Balkans, and in their expatriate communities and restaurants in the rest of the world. Coffeehouse culture was highly developed in the former Ottoman world, and this is the dominant style of preparation. Beans for Turkish coffee are ground or pounded to the finest possible powder, finer than for any other way of preparation. The grinding is done either by pounding in a mortar (the original method) or using a burr mill. Most domestic coffee mills are unable to grind finely enough; traditional Turkish hand grinders are an exception. Left: A cezve (a pot for making Turkish coffee). While there are variations in detail, preparation of Turkish coffee, like all types of coffee, essentially consists of immersing the coffee grounds in water which is most of the time hot but not boiling for long enough to dissolve the flavoursome compounds. While prolonged boiling of coffee gives it an unpleasant "cooked" or "burnt" taste, very brief boiling does not, and bringing it to the boil shows without guesswork that it has reached the appropriate temperature. The amount of cold water necessary can be measured using the cups. The coffee and the sugar are usually added to water, rather than being put into the pot first, although this is not essential—an article in Scientific American for November 1977 found that there were advantages to putting the coffee in first, then covering it with sugar and adding water without stirring. For each cup, between one and two heaped teaspoons of coffee are used. The coffee and the desired amount of sugar are stirred until all coffee sinks and the sugar is dissolved. Following this, the spoon is removed and the pot is put on moderate heat; if too high, the coffee comes to the boil too quickly, without time to extract the flavour. No stirring is done beyond this point, as it would dissolve the foam. Just as the coffee comes to the boil the pot is removed from the heat. It is usually kept off the heat for a short time, then brought to the boil a second and a third time, then the coffee is poured into the cups. Getting the thickest possible layer of foam is considered the peak of the coffee maker's art. One way to maximise this is to pour slowly and try to lift the pot higher and higher as the pouring continues. Regardless of these techniques, getting the same amount of foam into all cups is hard to achieve, and the cup with the most foam is considered the best of the lot. There are other schools of preparing Turkish coffee that vary from the above. 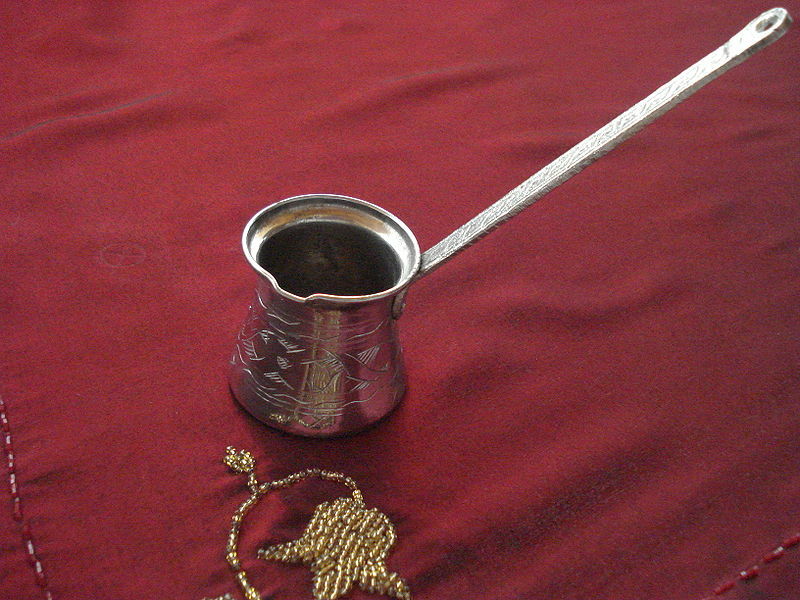 Lebanese coffee starts with hot water alone, to which sugar is added and dissolved. The product is in essence a sugar syrup with a higher boiling point than water. The coffee, and cardamom if wanted, are added, and the mixture is stirred. It is then brought to a boil two or three times; the double (or triple) boiling is an essential part of the process, both ceremonially and—as connoisseurs claim—for the palate. It has the effect of subjecting the coffee grounds to hot (but not boiling) water for longer, extracting more flavour without imparting the "cooked" taste of over-boiled coffee. Turkish coffee is taken at extremely hot temperatures and is usually served with a glass of cold water to freshen the mouth to better taste the coffee. It is traditionally served with Turkish delight. In the Mediterranean and southeastern Turkey, pistachio grains may be added into the coffee. All of the coffee in the pot is poured into cups, but not all of it is drunk. The thick layer of sludgy grounds at the bottom of the cup is left behind. 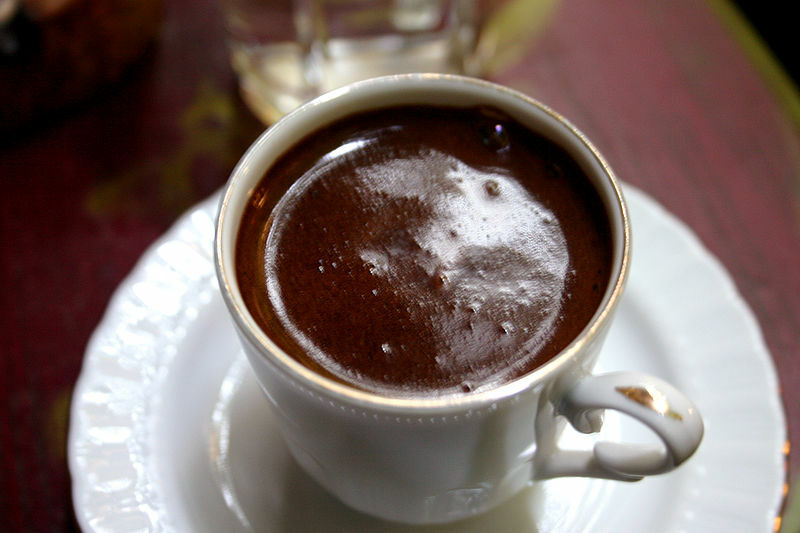 The grounds left after drinking Turkish coffee can also be used for fortune-telling. The cup is commonly turned over into the saucer to cool, and then the patterns of the coffee grounds can be used for a kind of fortune telling called tasseography or tasseomancy. 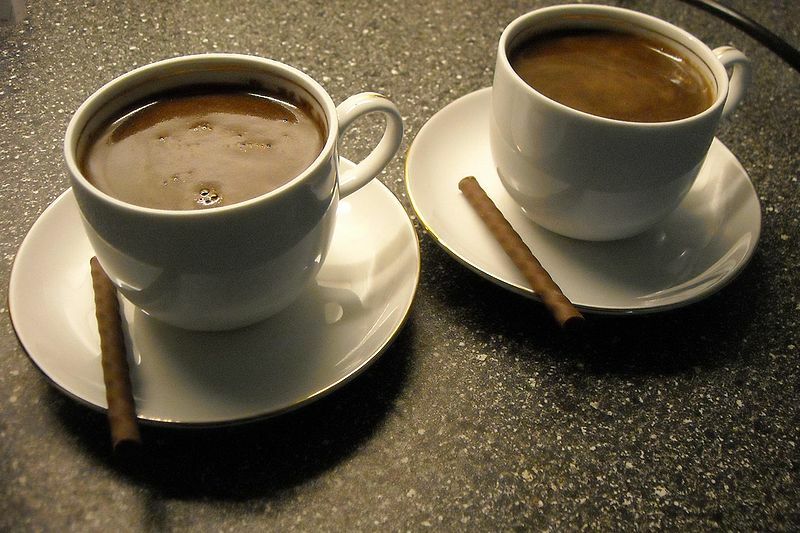 Left: Turkish coffee served with chocolate sticks.